I’m a little late on this, but I spent St. Patrick’s Day at Lincoln Square Lanes (a new discovery/favorite place in my neighborhood), where a trio called the Polkaholics played polka rhythms on rock instruments. 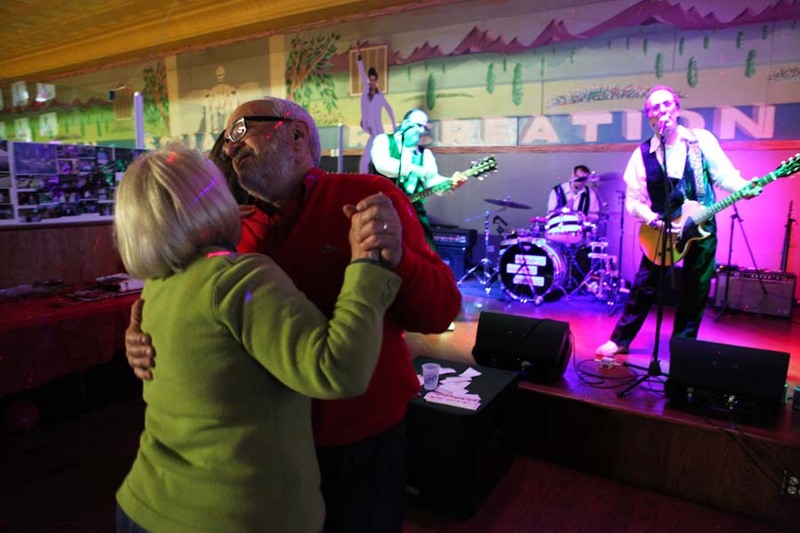 Their sets included favorites like the Beer Barrel Polka and the Hokey Pokey, which had the crowd dancing and sweating and screaming and hooting. The three musicians — “Dandy Don” Hedeker (on lead vocals and guitar), “Blitz” Linster on bass and “Stylin’ Steve” Glover on drums — played in a style that’s a delightful mix of Frankie Yankovic and Weird Al Yankovic. It made me a little nostalgic for Ohio. On Sundays when I was growing up, there was a show on a Cleveland TV station (WEWS) called Polka Varieties. The show’s opening announcement dubbed Cleveland the “Polka Capital of the World.” I used to watch the show with my grandparents in Mecca, Ohio. I don’t think Grandma would have liked the rock-influenced version of the thrashing oom-pah band that are the Polkaholics (not as much as I do), but she probably would have danced anyway. CORRECTION/COMMENT: Because I was in a hurry (and, well, lazy), I misnamed the band members in my original post because I cut and pasted from an old bio instead of reading my own notes from the evening. Those names have been corrected. Also, at the request of the band, I removed an observation you may see referenced in a comment below. A rather rough couple making an inappropriate gesture was an interesting thing to note in a blog, but on further reflection I can see how one word used to describe the gesture would color this post in a way I did not intend, so I’ve removed it. Nazi salutes? Sir, there was a band called the Ramones, who had a song called, uh-oh, Blitzkrieg Bop. People shake their fists in the air, “Hey Ho, Let’s Go!” But perhaps you are right and I just did not see the foul salute. Yes, I was there too.Thank you for all the pictures, especially the one of me with my lovely wife. Yes Cleveland,another great polka town. Don may well have records from there which he could share. Nice to find your blog, Craig.